Music recitals can be a terrifying trial for students but this is not true for young musicians from Forest Park’s Gasse School of Music. The atmosphere was safe and serene when they performed at Good Shepherd Lutheran Church in Oak Park April 6. Sitting on tiny chairs playing chamber pieces together, the students, from age 15 all the way down to age four, demonstrated the principles Daniel Gasse and staff have taught for twenty years. The performers included Daniel and his wife Sarah’s sons Ernesto, age nine, and Antonio, age six, playing their cellos. “We’re life-long professional chamber musicians who love the genre and have seen its amazing benefits,” Daniel said. “Now we are parents of children benefiting from our teaching experiences,” he added. Daniel and Sarah Gasse were not the only proud parents in attendance. The pews were packed with friends and family of the pint-sized performers. Each child had a more unique style. Some performed with self-confidence than others, but the show was never boring. The music was adapted to the different age levels of the students. The Gasse School teaches young musicians how to face the public, be comfortable on stage, and not become stressed by mistakes. They learn to focus on music in the middle of an environment full of distractions. Playing music is a real benefit for children and it can be seen in their everyday lives, Gasse said. Gasse teachers get feedback from parents saying their son or their daughter is doing better at school and even behaving better at home. They learn concentration and discipline and how to be a team player. Part of this listening skill involves balancing the sound of different-sized instruments. For instance Ernesto Gasse was playing a %u215B size cello, while his trio partner Ella Petersen played a ¼ size violin. These small instruments produce less volume and the piano can easily overpower the strings. Students also learn leading and following. Playing music as an ensemble teaches children to communicate. “Sports give kids a fantastic ability to learn teamwork and the same is true of music,” said Gasse. What is the biggest challenge in teaching Chamber music? Instrumental technique is obviously one of the most important parts of teaching music but it’s not the only one. “Frequently piano trios have disparity between the instrumental techniques required of each instrument,” Gasse said. This evolution was on display at the Oak Park church, as the students navigated complicated pieces with amazing ability. Sophia Preys played a violin concerto with no sheet music in front of her. She received a lengthy ovation. She then joined Jasper Park on piano and Antonio Gasse on cello to play a theme from a Mozart sonata. This was followed by livelier pieces, including “Spring Jazz” featuring the Gasse boys on Latin percussion. The concert’s finale featured Jessica Kriho playing three pieces on viola, including the rousing “Hungarian Dance No. 5” by Brahms. 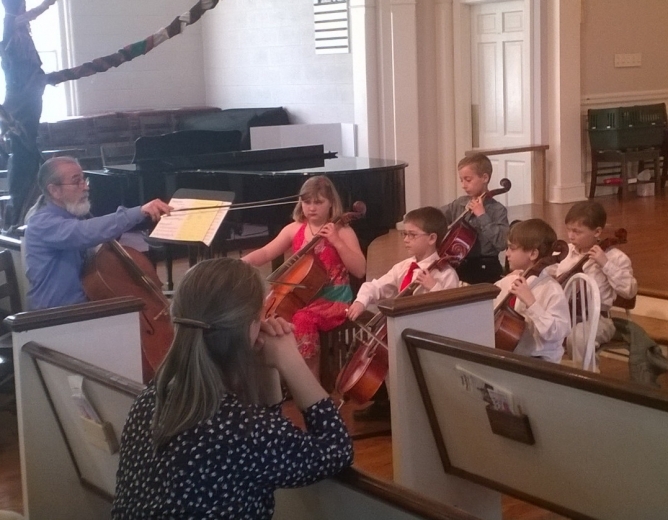 For next year’s recital, the Gasse musicians won’t have to play in Oak Park. That’s because the Historical Society of Forest Park has negotiated a lease with First United Church of Christ for space to exhibit historical artifacts. The church at Harvard and Elgin is also available to rent space for concerts and plays. It has a beautiful sanctuary with excellent acoustics for musical performances. Daniel Gasse is looking forward to relocating recitals to what could become Forest Park’s new cultural center.